You shouldn't visit Bavaria without seeing at least one of the five Castles of Ludwig II. You've probably heard of Neuschwanstein, but there are four others. There is some dispute about whether Ludwig II was mad or not, but at the very least he was eccentric. But while he lived he built extravagant castles. There was a family "precedent" to the strange behavior of Ludwig II. His grandfather, King Ludwig I, came from a family of eccentrics and was also deposed. This moniker sounds better doesn't it? And why Swan King? 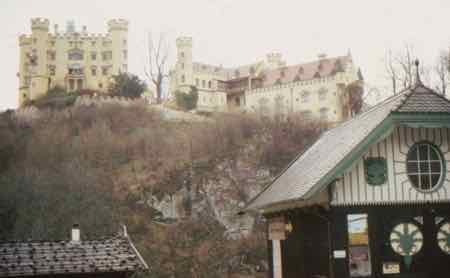 Ludwig grew up in Hohenschwangau which translates to High Swan Country Palace in English. That castle is on Schwansee or Swan Lake. 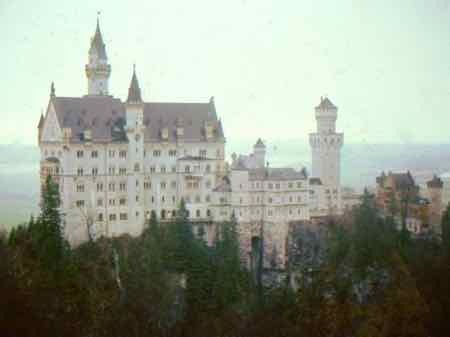 And he loved the area so much he built Neuschwanstein which translates to New Swan Stone Castle)... right there on the next hill over. This is the most famous of the castles he lived in, and it is high on most tourist lists. He built two others and grew up in two older castles. Touring all five of the castles of Ludwig II makes for a fun trip to Bavaria. He was born in Nymphemberg Palace. The city of Munich has closed in around it, so it now sits in a suburb of Munich making it an easy day trip while you're there. He lived for much of his childhood in Hohenschwangau. This was the 12th century castle his father had re-built near Fussen on Schwanee (Swan Lake). It's a "homey" castle if you can say that about castles. Ludwig loved the area so much that he had Neuschwanstein built nearby on the top of the hill. 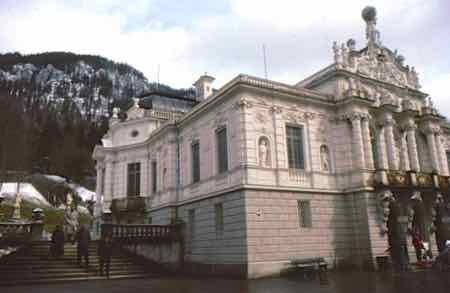 Near Oberammergau you can visit Linderhof. This small castle was Ludwig's favorite and the only one he completed before he died. It is surrounded by beautiful gardens with fountains. It's set among rolling fields and forest. The Moroccan house with it's brightly tiled interior is quite a sight. Visit the Grotto which is an artificial cave with artificial stalactites and an artificial underground lake. The Mauritanian Kiosk is another small building with an amazing interior. On the island of Herenchiemsee in this lake, you'll find another of the castles of Ludwig II. . This was the last one to be built. It's called Neues Schloss or Konigschloss. 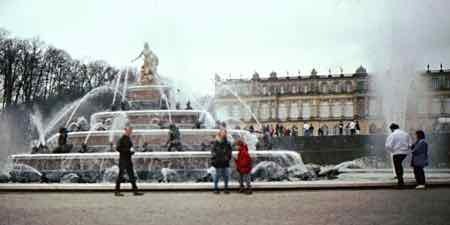 It was meant to be a replica of Versailles, but it wasn't completed because of the "mysterious" death of Ludwig II. Even with only the central part completed, it's pretty amazing to tour. You have to pay for the round trip boat fare in addition to the entrance fee. 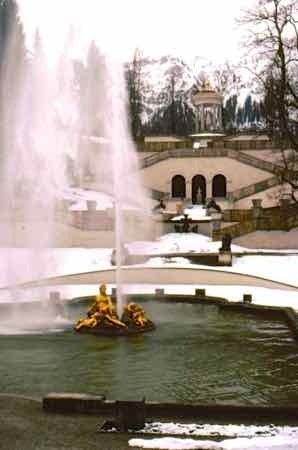 All of the castles except for Nymphenberg require guided tours. You will get an assigned tour time. Tours at each are available in German, English and several other languages. You could take a fun driving trip to see all of them. Schloss Herenchiemsee is about 60 miles (96 km) south east of Munich and Schloss Nymphenberg. Loop across southern Bavaria to Linderhof, Hohenschwangau and Neuschwanstein. Those three are close together, about 100 miles (160 km) from Herenchiemsee. Drive back to Munich, and you've got a great trip.